What is viscosity, how does it affect coatings application, and what do the metrics mean to you? First, viscosity is a measurement of resistance to flow. At room temperature, honey is a fairly viscous material. It will flow, slowly, in response to the force of gravity. When removed from the refrigerator, it will flow very slowly, and with a few seconds in the microwave, it will flow much more easily, and swiftly. While the property of viscosity is important to virtually all liquid coating applications, I’ll focus here on how it affects the spray application of coating materials. The Product Data Sheet, Technical Data Sheet, or package directions will often show a “package viscosity”, and a recommendation for thinning or reducing the product. Some products are sold as “Ready to Spray” (RTS) or “Ready To Use” (RTU). The recommended spraying viscosity will be different unless the material is sold as Ready to Spray (RTS), Ready to Use (RTU) or with similar wording indicating that reducers will not be needed under ordinary conditions. More detailed instruction may specify a “spraying viscosity”, at a specific temperature most often at 77⁰F. Obviously, the manufacturer believes that the viscosity of the product is important. Why is that? 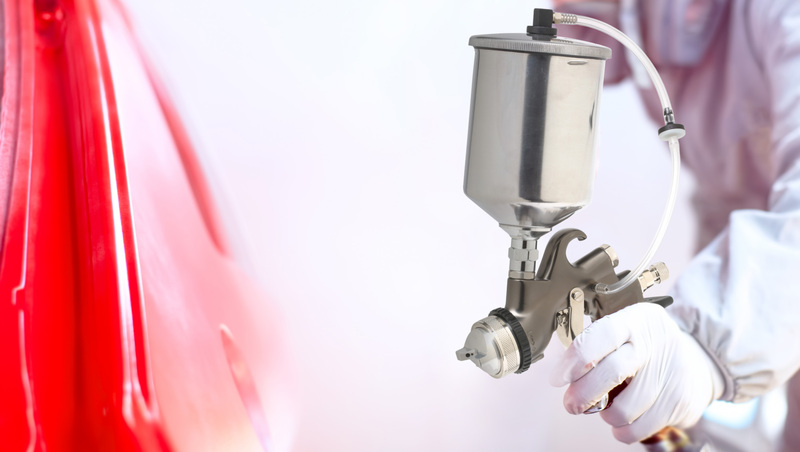 When spraying a coating, we utilize energy to break up the coating into tiny liquid particles. 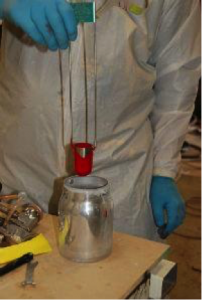 In a spray gun, conventional, compliant, HVLP, or LVLP, the pressure of the atomizing air provides that energy. In an airless or air assisted airless, the fluid pump provides most of that energy. The higher viscosity material requires more energy to atomize properly. A very low viscosity material however, may be over atomized (creating more wasted material due to overspray, dry overspray causing a rough surface, too rapid drying impeding proper flow out, lower dry film thickness per coat). 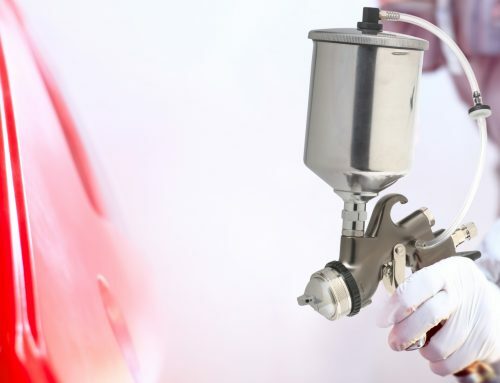 Spray equipment manufacturers will specify certain equipment or components (guns, needles, tips, orifices) for use with a range of viscosities, and the settings for fluid and air pressure may have to be changed to optimize the set up for varying viscosities. Since the one of the primary objects of spray finishing is to apply the optimum amount of coating in the most efficient manner consistent with the quality desired, a finishing system that can apply a coating with the maximum film build in the least number of coats, with the least waste of material and labor is a good goal for the finisher. When the atomized coating material contacts the surface of the object to be coated, the liquid particles, which are losing solvents already, come in contact with other particles, they will coalesce, or flow together, to form a more or less uniform film. If these particles are of too high a viscosity, they will tend to form a less uniform or level film, may deliver insufficient volume, poor atomization, and orange peel or rough finish. If they are of too low a viscosity, they will tend to flow excessively, making coating a vertical or tilted surface a problem. Fatty edges, runs, and curtaining can occur. 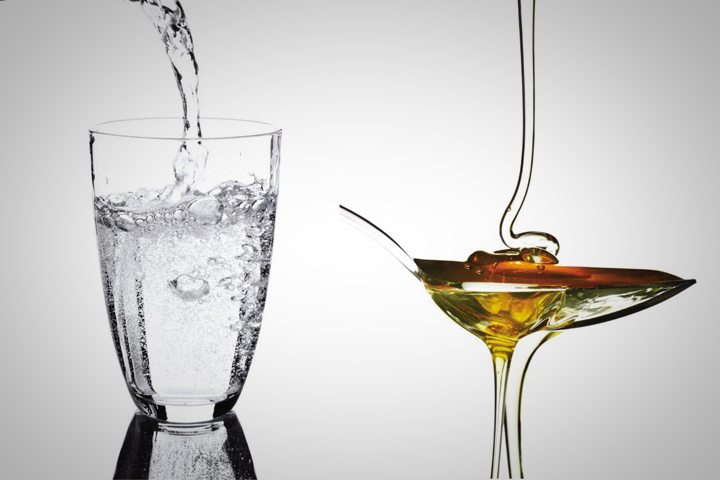 There are many methods and tools for measuring viscosity. For most uses in the coatings industry, in the laboratory, in production QC, and in the field, simple viscosity cups are used. These cups will momentarily contain a specified amount of liquid which is allowed to drain from the cup. The time it takes to drain (efflux time) is measured with a stop watch. The variation is greater in higher viscosity materials. The variation is generally close to linear between 23°C and 27 °C (73.4°F and 80.6°F), but the user should be aware that the change may not be truly linear even within a narrow temperature range. Because even slight variations in the temperature of the fluid may affect viscosity, and thus efficiency in spraying, the air temperature, fluid temperature, and the temperature of the test equipment should be very close to 25° C(77°F). This is especially important when measuring fluids containing fast evaporating solvents, where evaporative cooling can be a factor. ASTM D4212 is the standard governing viscosity measurements by the Zahn Cup. Viscosity testing may be used to determine that a coating is within specifications, and to adjust the viscosity to suit the intended use in the intended application equipment. Attempting to spray too high a viscosity material may result in insufficient volume delivered, poor atomization, and orange peel or rough finish. In the attempt to spray a too viscous material, the operator may turn up the fluid and air pressure too high, thus increasing energy costs. If viscosity is too low, more coats will be required to achieve the desired film thickness, waste will increase, and runs, sags, and curtaining will more likely occur. Too thin a finish may also cause more dry overspray in low humidity/high temperature conditions. It is generally better to adjust the temperature of a coating to achieve the proper viscosity than to add reducers to compensate for cool material. Typically, this is more economical and has fewer side effects than using reducers, retarders and flow enhancing additives. Insure that the coating to be measured is at the specified temperature, is well mixed, and is free of air bubbles. Inspect the cup insuring that it is the appropriate cup for the type of material to be measured, that it is clean, especially in the orifice area. Hold the cup by the ring at the top and immerse the cup in the liquid so that the top edge of the cup is about ½ inch below the surface. Quickly withdraw the cup from the liquid and at the same time start the stopwatch. Carefully observe the efflux stream, and at the first distinct break in the stream, stop the watch. Record the number of seconds of drain time, to the nearest tenth of a degree, the temperature, and the type and size (#) of the cup. The finisher should frequently test the viscosity of the materials he/she is spraying, as directed above. Over time he/she will find the conditions that, with his equipment, yield the best results. Only when it is determined that the equipment is appropriate for the material, and that the temperatures at application are correct, should reducer, retarder, or flow enhancers be added to the material to improve performance. Equipment manufacturers often provide a viscosity cup with their equipment. Some are plastic, others are metal. You can purchase a plastic viscosity cup for as little as $5.00 and a precision viscosity cup for $200.00 or more. There are good metal viscosity cups priced between the two. They will provide the necessary measurement to establish recommended viscosity. Accurate viscosity cups are precision instruments, and need to be properly maintained. For very critical uses (generally in a lab environment, periodic recalibration of the instrument is recommended. Cleaning after use is important to maintain a consistent orifice size for future reference as well as care not to distort the orifice. For instance, a plastic cup dragged across a rough surface may change readings because of a roughening of the opening. I don’t deny that there are many good finishers who get their viscosity measurement by holding a stir stick, wet with lacquer, over the can and watch it drip. With so many changes in material in the last few years, it would be prudent to use a more precise measure to ensure the best use of your expensive equipment and materials. Viscosity is a very important property of the coating, and temperature of the coating is the most important variable that the finisher has to affect the viscosity.